Costa Cruises’ future flagship, the 132,000-ton Costa Diadema, reached a construction milestone at the Fincantieri shipyard in Marghera, Italy, on Sept. 5 when its fore-end block hull section was laid. 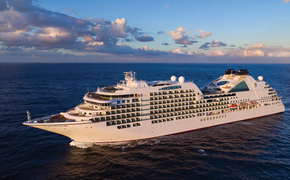 The 4,947-passenger ship is scheduled for delivery on Oct. 30, 2014. The word “diadema” in Italian means “tiara,” so it reflects that the ship will serve as the “crown jewel” of the Costa fleet, the company says. It is the new flagship because it will be the largest cruise ship flying the Italian flag. When it enters service, the Costa fleet will have capacity for up to 45,000 guests. The fore-end block section is approximately 26 feet high, 111 feet long, 118 feet wide at its maximum beam and weighs 432 tons. Costa Cruises is investing approximately €550 million (about $722 million) to build Costa Diadema. It is the 10th Costa ship built in Italy by Fincantieri since 2000, representing a total investment of almost €5 billion (about $6.5 billion). Costa Diadema will have new wine-tasting venues, the Bavarian Bierkeller for a wide selection of beers, and new dining choices such as Japanese teppanyaki, pizza parlor and a gelateria. New entertainment offerings include the country rock club featuring American music and arcade-style interactive games. The Portobello Market Piazza will be the heart of an 11,840-square-foot area with designer stores and retail outlets. The ship also will have a three-level Samsara Spa on the upper decks with an outdoor area.